A few weeks back I posted my submission to Thorzul’s Nightmare On Cardboard contest and I was lucky enough earn a tie for second place with Matt from Heartbreaking Cards of Staggering Genius. Slangon from Condition Poor took First Place with his awesome transformation card, his card really stood out among all the cards this year. As my prize I received an awesome Cracker Jacks 1, 2, 3 Strikes You’re Out! 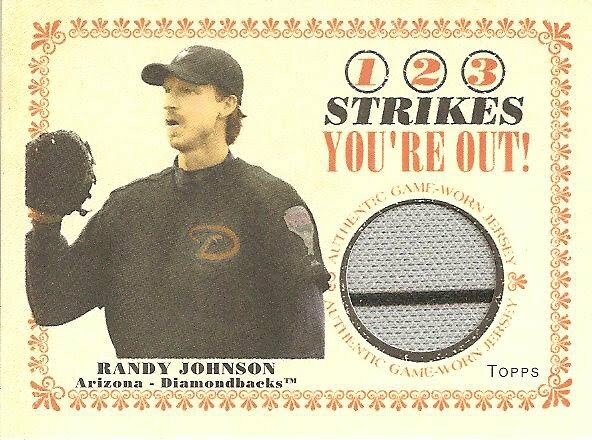 Randy Johnson relic card. Amazing card too, it is a bit larger than a standard mini and includes a cool purple pin stripe. I like the current red brick colors for the D-Backs but real men can wear purple. Not to mention Johnson played for both the Diamondbacks and the Mariners so a double dose for me. Thanks Thorzul, I look forward to next year. 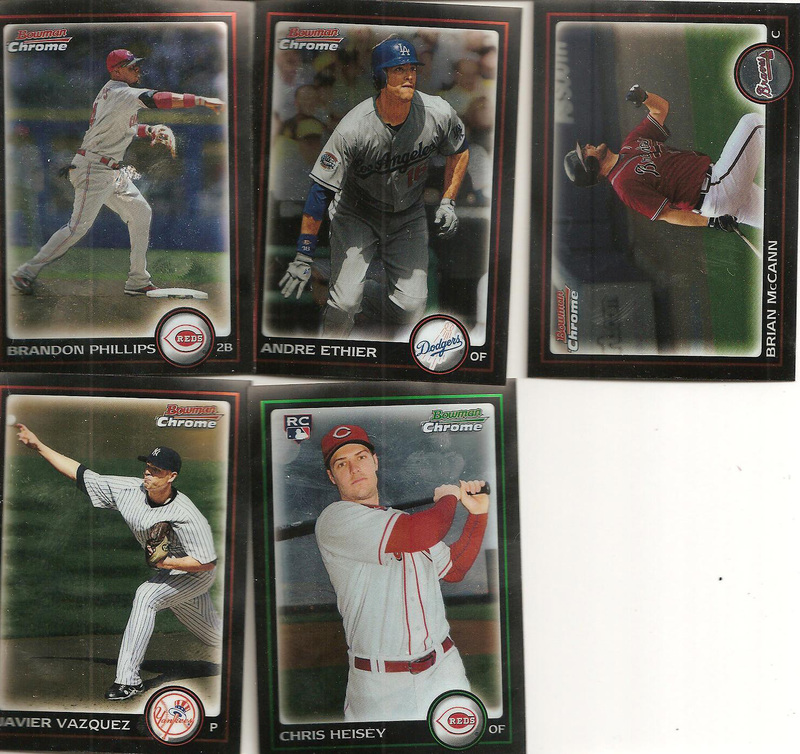 I gave in and picked up a rack pack of 2010 Bowman Chrome Baseball for $9 from Walmart. I am not a fan of the various chrome releases because of the famous bow not to mention in typical Topps quality control style my cards were damaged, had scuff marks and finger prints and were covered in a fine white powder. 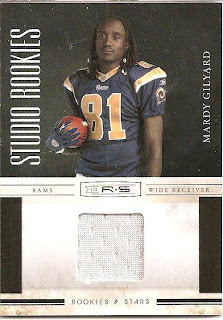 The packs were loaded with mediocrity in a wrapper. Would you pay $70,000 for this card? 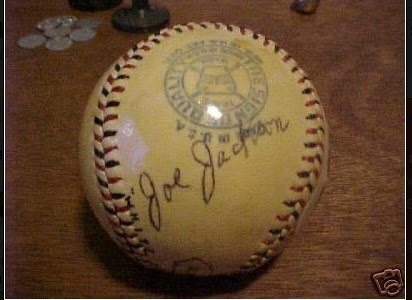 Leaf is estimating that this real Joe Jackson autograph (most Jackson autos were actually signed by his wife) could eventually sell for $70,000-100,000 and they recently announced how this card could make it in to the hands of one lucky collector. 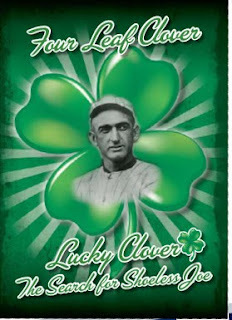 On December 7th, 2010, Leaf will be releasing the Leaf Cut Signature Edition Update and in 3 boxes there will be a special Lucky Clover Joe Jackson card. A 4th Lucky Clover card will be sent to the collector who presents Leaf with the “Most Complete” set of 2010 Sports Icons Update. 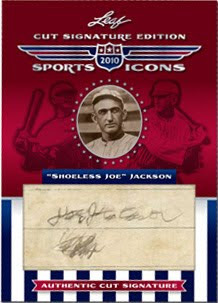 One of the holders of these 4 special Luck Clover cards will walk away from the 2011 National with this very Shoeless Joe Jackson cut signature card, as a consolation prize the other 3 Lucky Clover card holders will each receive a case of 2011 Leaf Sports Icons Cut Signature. Is $70,000 a realistic number? I understand that this is an actual Joe Jackson signature so you have to take that in to account, because Joe Jackson was illiterate his wife Kate Jackson signed most of his autograph requests though latter in his life he learned how to sign his own name so he could sign checks and legal documents and this appears to be one of his early signatures. The last “real” Joe Jackson signature sold in the early 1990s for $24,000 so I guess it is possible that this card may actually sell for $70,000 but I do not see a cut signature card ever selling for that price. In comparison his Will, a legal document that he signed in front of witnesses, has been estimated to be valued at $100,000 so that may put things in to perspective. Yesterday was a very sad day for Seattle with the passing of Dave Niehaus, the voice of the Seattle Mariners. As a fan of the Mariners since their inception I have been listening to Dave since I was a kid and this is a tough loss. This man has been there during the bad (very bad) times and he was there for the good times, he has seen some greats come through Seattle and he will be greatly missed by fans and players alike. Years ago Donruss had one of the best “other” releases in the Americana series, a wonderful collection of sports and non-sports personalities that included some of the coolest relics and autographs. 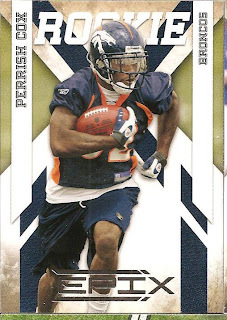 In January 2009 Donruss announced the upcoming Donruss Century Collection but because the company soon saw its own demise the product never saw the light of day. Fast forward almost 2 years and Panini recently surprised collectors when they released preview information of the upcoming Panini Century Collection. I want to point out the use of Nolan Ryan’s high school basketball photo on his relic card; someone had to do some serious research to find this gem. 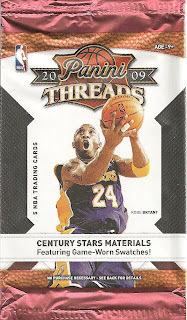 Since the original inception of the Century Collection the product has changed from a $100/box to a $200/pack release. You now actually get 1 additional hit over the original Donruss planned release but gone are the base cards, the parallels and inserts. This set is now all about the hits. I was fortunate enough to pull a James Cagney relic, one of my favorite actors, out of the Americana series a few years ago and I really look forward to continuing my luck with this release. I give this 4 out of 5 because there are pluses and minuses with the design. Some make you wonder why Panini went that way and others look complete. The checklist is also a huge plus but the price point is a huge minus. I am not in a position where I can purchase any packs when they are released in December but hopefully around tax time I will be able to pick up some packs. This is one of those releases where you want to bust a couple of packs no matter if you like Panini or not because they did a wonderful job here. This set has been a solid contender, excuse the pun, each year and looks to continue that trend with only one slight change, the manufactured prime patches now being included on the Rookie Ticket autographs. Panini has changed the name from Playoff Contenders Basketball to Playoff Contenders Patches Basketball. The Rookie Ticket Autograph cards are being changed to now include a manufactured prime patch which some people may not agree with but I actually like it, the new look of the card now seems complete with the addition of the prime patch. I honestly would be surprised if these do not draw some big interest. Some may find the “Place In History” autographs an interesting pull, an insert that focuses on players who were drafted by one team but were traded away without ever playing a game for the team. Players like Kobe and Charlotte and Pau Gasol and the Hawks. I think it is an interesting idea but the designers did not pull it well together, the set features a player with the draft team hat on imposed over a newspaper. 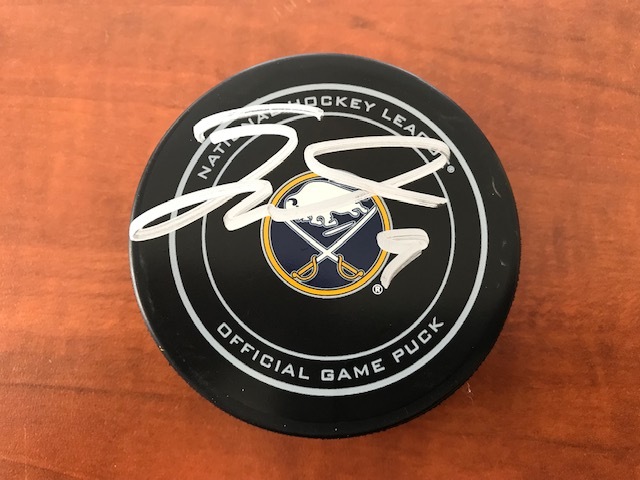 I think they should have used the player image from draft day and somehow involved the team’s logo to tie it all together. Seems to be a solid list of autographs including Amar’e Stoudamire, Derrick Rose and Kobe Bryant. I will give this set 3 out of 5 because it is a standard set that meets expectations. The addition of the manufactured prime patch only adds to the Rookie Ticket Autograph cards. The only down side would be the use of stickers on an otherwise decent basketball set. 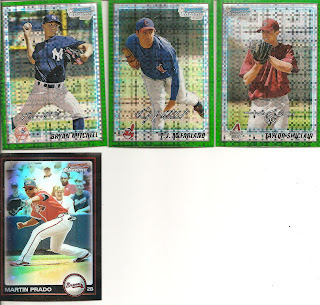 The next blaster box that I am going with is from a set I normally would not have picked up if it were not a random blaster box review. 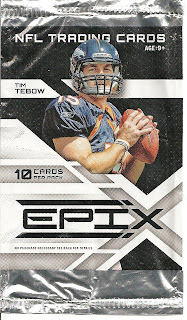 The 2010 Panini Epix Football set is one of those sets that actually bring me back to the old Fleer sets from the 1990s. This is a typical Panini set with angles and colors in all directions. I am not a fan of these types of designs; I feel they take away from the players who should be the focus of the card. With the base set I pulled quite a variety and with 80 cards per blaster box you feel like you do get your money’s worth. Sad to say I pulled only two Seahawks players; Hasselbeck and ex-Seahawk T.J. Houshmandzadeh, but I also pulled newly acquired Marshawn Lynch, which made me happy. For the Cardinals I pulled only Beanie Wells, well actually 2 Beanie Wells cards along with ex-Cardinal Anquan Boldin. The inserts seem to be picked up right from Fleer’s drawing boards so there is an air of yesteryear when you pull an insert. The Ball Hawks is just plain UGLY. 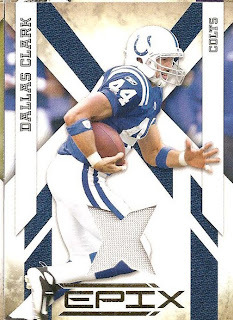 Who decided to not only use the lines and angles but also thought it would be a good idea to take a relatively small image of the player and toss it on a card with horrendous font? The Rush Hour card is what actually reminds me of the old Fleer inserts and this I can appreciate. The use of green and hash marks actually gives the viewer the impression of a football field. 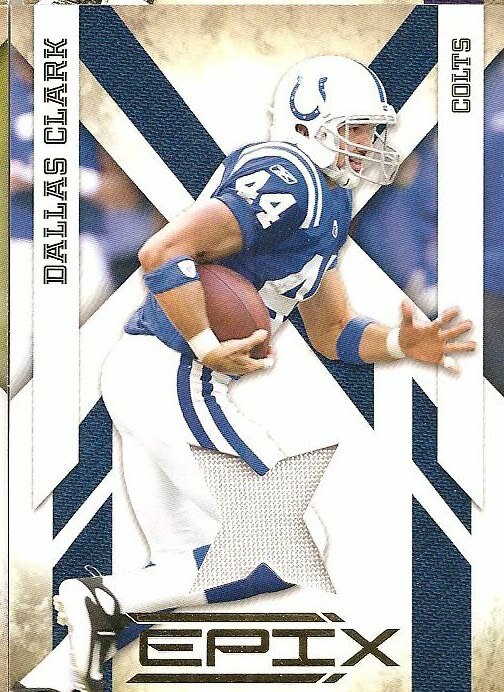 My hit is a Dallas Clark single color jersey #/299, which normally would not be a bad hit had it not been for the use of an “X”-like die cut window over the jersey. Had this been a simple square it would be a nicer looking card. It has been almost a month since I last posted about a random blaster box so I figured since I have 6 blaster boxes worth of packs sitting on my dresser I better get back to this subject. And do a little catching up. Today’s post comes from a blaster box of 2009-10 Panini Threads Basketball set, one of the pretty standard sets coming from Panini. I do like the use of action photos, basketball cards are one of the best options for the action collectors. Close up images and some of these photographers captured amazing shots. The base cards that drew my interest originally would be the Durant card and the 2 ex-U of A players Mike Bibby and Andre Iguodala along with a jersey die-cut of Agent Zero himself, Gilbert Arenas. So a Durant and 3 U of A players were enough to make me smile. I pulled a couple of parallels of which I am not certain of which parallels they are. The pack lists the base parallels as Silver/Gold/Platinum/Orange Century Proofs. The problem I am having is that the break down goes as such: Silver #/499, Gold #/99, Platinum #/25 and I can only find limited info on the Orange Proof and all I came across is “elusive” when described. 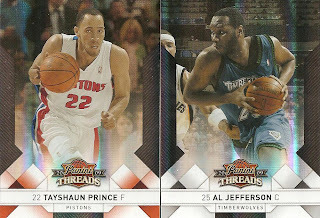 My Al Jefferson is #/249 and my Tayshaun Prince, which is obviously a reddish/orange color on the front, has no numbering on the back. Any help deciphering this would be appreciated. I pulled a couple of the jersey die-cuts, Gilbert Arenas and Vince Carter. I like these cards being the shape of a jersey, it works well for basketball cards. I would love to pull an autographed version of these cards. 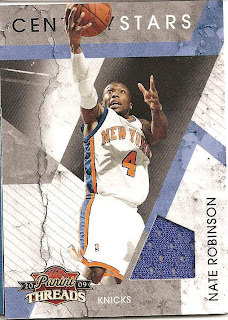 The “hit” is a Nate Robinson jersey relic Century Stars insert. 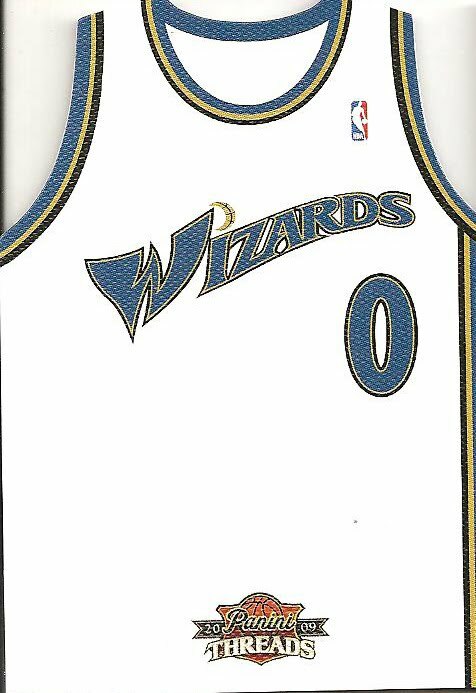 I cannot get over the hilarious design, who thought it would be a good idea to toss a player on top of what appears to be a crumbling wall with angles in all directions and then toss in a die cut window over the jersey? 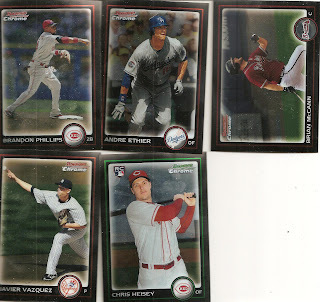 After going through the packs again I came across a collection of young and old stars. Some old dogs still holding their own in the league like Tony Parker, Paul Pierce, Ray Allen and Chauncey Billups. That is 6 NBA titles in just 4 players; given Parker has 3 of them but still an impressive list no matter what. Next up are the young guns, along with Kevin Durant I also pulled his teammate Russell Westbrook, Deron Williams, Brandon Roy and CP3. While none of these players will be on a title winning team any time soon they are definitely on teams that can hold their own and may be a force in the future. My last card is actually a trivia question type of card. Who went from being the #2 Pick overall in the 2008 NBA Draft to being traded away by the Heat to make room for King James and Chris Bosh? Why that would be that Beasley kid up there in Minnesota. You know that place where Garnett demanded to leave and Rickey Rubio refuses to play at. The good news is that if the Timberwolves try hard they may make it back over the 20-win season hump. Does Topps even care about quality control or do they just deal with reactionary QC? 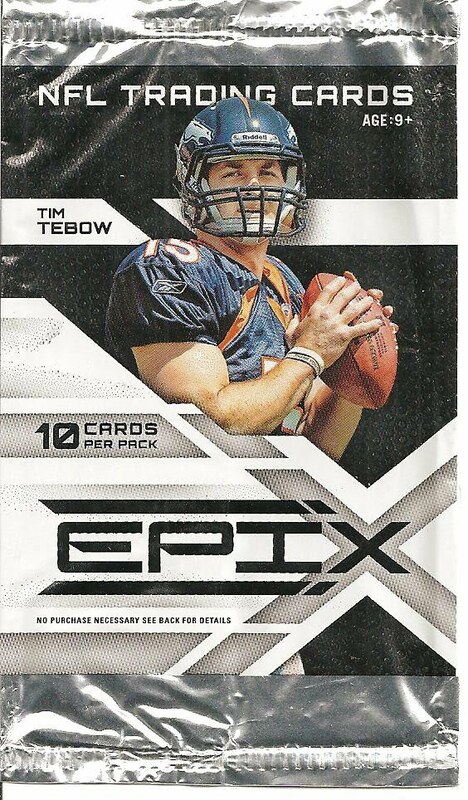 Topps, the point is that the missing and damaged cards should be dealt with before the packs get out in to the hands of the collectors especially when your company is known for poor quality control. You are tossing a bandage on the wound after the fact and still making the collectors jump through hoops to get the cards that should have been in their boxes originally. Scan: Scan in the pack wrapper, UPC and receipt. I guess someone who buys a pack with damaged cards is S.O.L. because they do not have a box UPC to scan or how about those shops that do not give receipts or give hand written receipts. Send: Then you need to package up your damaged card, original receipt, pack wrapper and UPC and send them to Topps Customer Service at your own expense. Wait: Then wait patiently...days, weeks or months to get the card in your hand that should have been in your box. Being the pushy a-hole that I am I wrote Clay Luraschi of Topps regarding their poor quality control. For those that remember, I wrote My Luraschi back in July about them sending loaded boxes to Beckett and never received a response. Again I do not expect a response but I felt it necessary to at least put in the effort. As part of the conversations I have had with Candian artist Mike James I recently did an interview about his art work as well as his sports and team alligiences. - I have to ask, are you a collector? If so what do you prefer to collect? "I used to be a big baseball card collector starting in the early 90s - once I started painting full time in the 2000s I switched to being a hockey card collector - most of the paintings I was doing were of hockey players, so I used them as reference often. I have stopped collecting almost completely now - just buying the odd card here and there." - How long have you been creating sports related artwork? "I have been painting since the mid-90s. I started painting portraits on baseballs as a way to pay my way through university. Most of the work that I do now is sketches and painted jerseys. I was painting full time 7 or 8 years ago, but now I work full time, so this has become more of a hobby." - What is your favorite sport and do you have a favorite player/team? "Growing up, Cal Ripken was my favorite player, and I used to go to see the Orioles play every time they came to see the Blue Jays. I am still a big baseball fan and hockey fan as well (although I am Canadian but don't know how to skate!!!) - As for hockey, my favorite player is (Alexander) Ovechkin, but mostly because I really enjoy painting him as he is very distinctive looking." 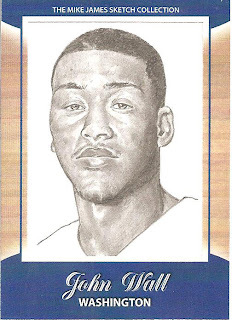 - I have seen your work appear on jerseys, baseballs, canvases and sketch cards; do you have a favorite medium that you prefer to work with? "I started with pencil crayons, and moved onto acrylics. I prefer not to use oil paint because I can't get the same type of detail that I can with the acrylics. I have only started using pencils again this past year." 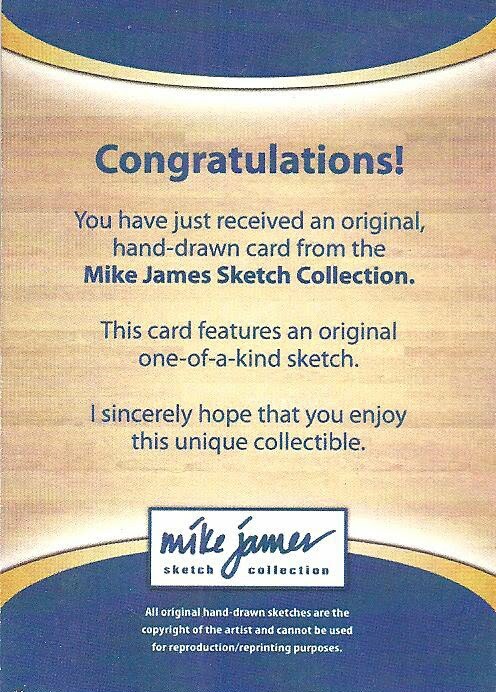 - I first came across your work while writing a piece about the Topps You Sketch It cards. 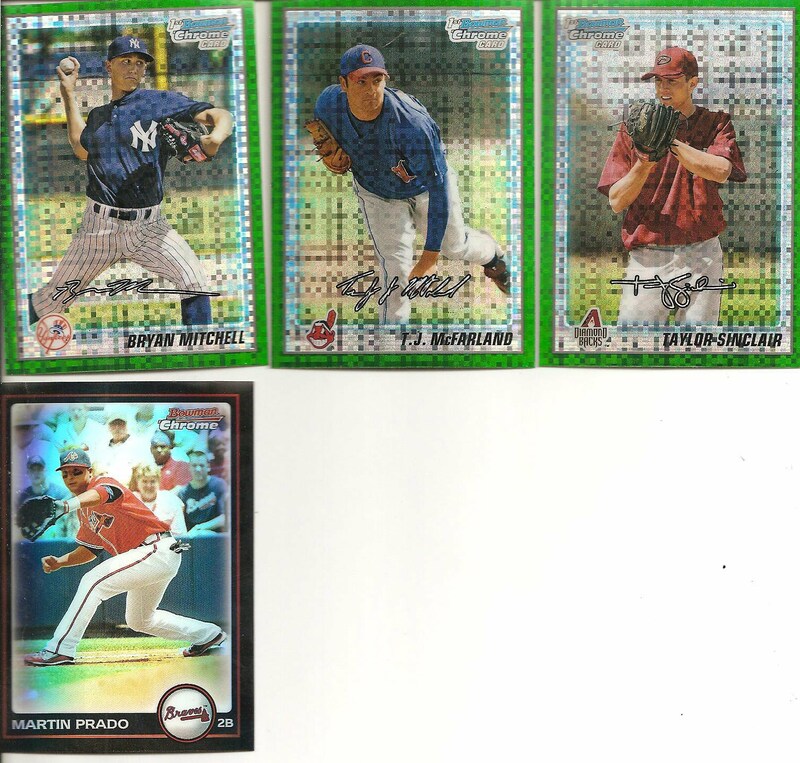 Using the Topps Sketch It cards you created a number of ACEO cards; will you continue using these cards or similar opportunities? "I started sketching my own cards last year before the Topps 'You Sketch it' cards came out - the first custom group were not nearly as detailed as the ones I am producing now - took me a little while to get back into the swing with pencils as I hadn't used them in quite some time. I have done a number of the Topps cards now - mostly for collectors, but some of them I have sent in to Topps to see how they do." -Is this where you sell your work or is there a way that interested collectors can find your work or get in touch with you? "I only list items here and there to showcase my work when I don't have any other art on the go - my (eBay) user-name is all-star2002. If people are interested in my work, they can email me at this address: allstarillustrations- as long as they know that this is a part time gig, so never sure what my schedule is like." 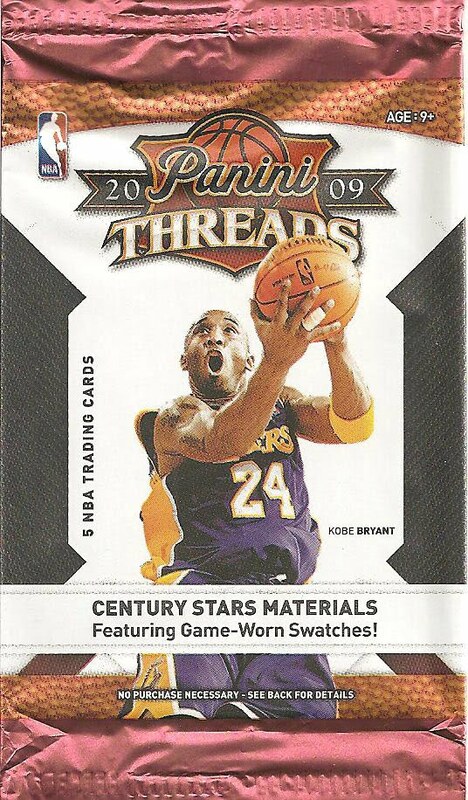 - We have seen your work appear in the hobby before, in the 2003-04 Be A Player “Brush With Greatness” insert & jersey grand prize, do you have anything coming up in the near future that collectors can be looking forward to? 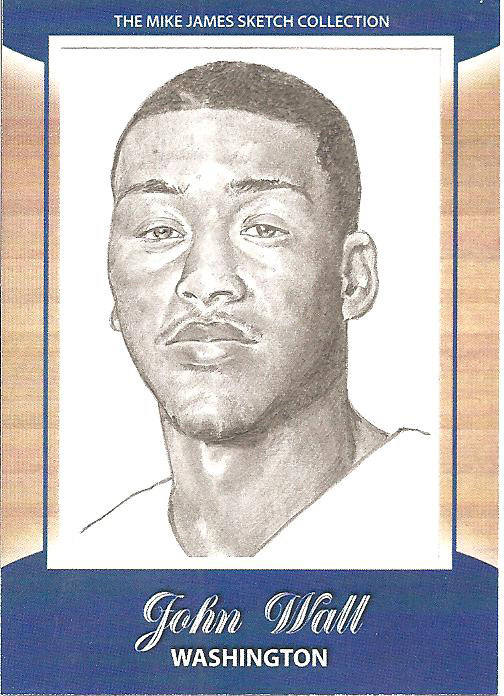 "Ahh...there are some things in the works, but don't want to give too much away...but if you look closely at some of the images that have been released from the new upcoming Heroes and Prospects baseball set...you might just see a pencil sketch or two..."
- Can you highlight some of your work over the years? 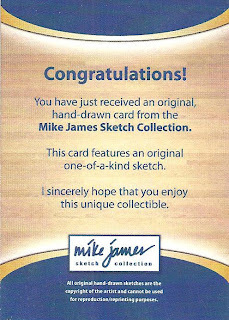 Keep an eye for a forth coming follow up to my conversation with artist Mike James, I will be completing my "Meet The Artist- Mike James" segment with a final posting including some more of his artwork and possibly a special contest. 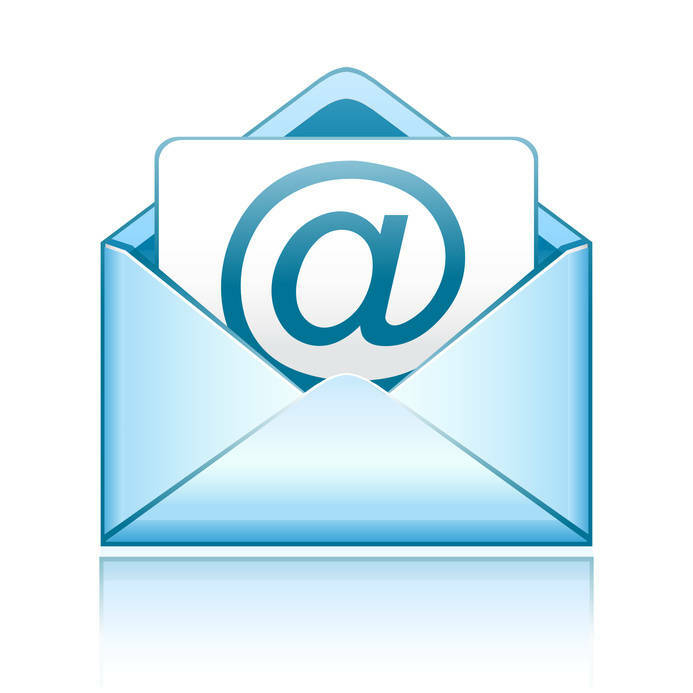 I recently received an email from Sheryl at Satellite Dish, a website dedicated to satellites that offers expert information to readers nationwide. 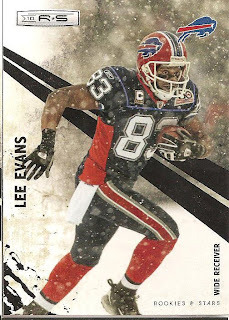 Interestingly enough the web site includes list articles covering the “Top” of various subjects such as “Top 10 Movie Action Stars of All-Time” and “40 Video Game Blogs Classics and More” and the reason I was contacted is because my blog has been included on one of their most recent list article: “25 Fantastic NFL Football Card Collecting Blogs”. This is truly an honor to have my blog included on a list with some heavy weight hitters like the Upper Deck blog, the Beckett blog, Sports Collector Daily and Night Owl Cards. I appreciate being included in this list and would like to thank Sheryl and Satellite Dish for creating a web site that takes the time to not only support their own community (satellites) but even goes beyond that to support and honor other communities like sports cards, video games, television and classic cars. We may belong to different hobbies but we are all the same collector inside. I wanted to highlight one specific blog listed, Nearmint’s Vintage Football Card Blog. This site is a wealth of vintage football cards and is well worth the time to read through if you are a true vintage collector. As part of his web site he also includes a vintage football card gallery that includes checklists and images of football cards dating back to the 1888 Goodwin Champions set.